I was never sure if I'd ever met a true Narcissist. I mean they are so hard to pick out, sort of like high functioning sociopaths. And there are times in my life I could have been called narcissistic where I was really only concerned with my own feelings, my own self, my own well being. But at the end of the day I didn't only care about those things at the expense of others, I didn't step on others to get where I needed to go, but I didn't let others dictate what I wanted to do. 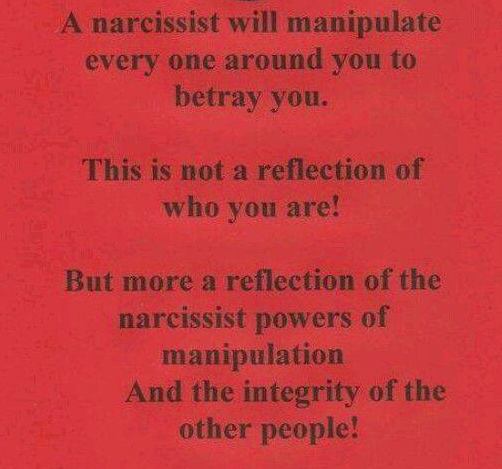 The scary thing is that Narcissists don't see their tendencies in their behaviour. It makes them very dangerous. Most of the time they will manipulate the truth so that it suits their needs. Do they need some one to be the bully in the story? Do they need sympathy for a fall out of events that occurred? Do they need someone to be the scapegoat for what they forgot to do? Are they not the most popular person in the room and have a desire to be? I've known girls (and I'll talk about girls because I am one and most of my friends are girls) who have lied about things that were said in a conversation so that they look like the victim, but when you actually ask around you find out that the other sides story is the complete opposites. I've known girls that will hide objects in other peoples places to to make it look like they stole things so that people don't trust them. I've known girls that refuse to take responsibility for their actions. Everyone else and Ever situation is to blame for their predicament. When you confront them with the truth, they find excuses for why it wasn't their fault or how you have it wrong. It becomes a game, and they are the best double talkers out there so it just gets overly confusing and if you can't think as fast as they do, you get screwed!! When someone lives in fantasy and you live in reality it doesn't matter how much proof you bring to them they can't see your reality because it will destroy their illusion. 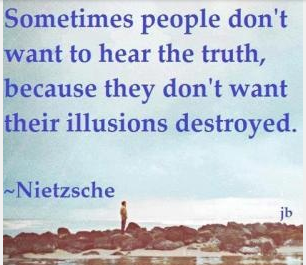 And if their illusion is destroyed, then people will see them for who they are, and since they don't even truly like who they are how on earth could anyone even like them? I struggle with this, because I am definitely a fighter, not in the physical sense, but in the sense that I will fight with words. 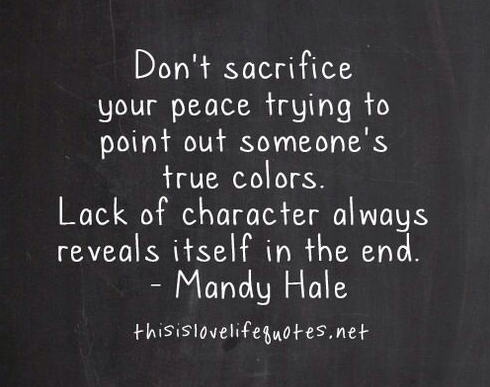 I'm a great talker and can generally diffuse most situations, if things feel like they will get physical I leave. I am not a great punch thrower, so I leave that to others. 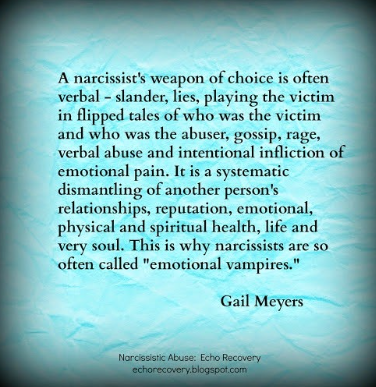 But Narcissists don't fight they are of the flight variety. And they do a lot of plays behind the scenes to cut you down at the knees. But they do it in such a way that to others you look like the bad guy. It's an incredibly hard battle to fight or even hope to win!! The best recourse is to just walk away, leave and as soon as you recognize a narcissist run away and stay as far away as you possibly can, don't introduce them to other friends because they will find away to ingratiate themselves with these friends to help keep themselves in your life. A girl with no long term friends is a big red flag, and if all her long term friends leave her because they can't deal with her it's not really a reflection on them, but a reflection on herself. So she needs to be able to say she's been friends and shared experience with someone for many many years. This doesn't mean that you need to have friends from elementary, or high school, but having a friend who has gone through the ringer with you in some important events in your life is important. Not just for how it looks on the outside, but really for your own state of mind. But one of the biggest Narcissists I have ever seen was Sami on Days of our Lives. My God that girl text book for many years. Another Narcissist character that's recently been highlighted is Gone Girl, she was a complete narcissist and sociopath (double danger). I know that a friend of mine is dealing with a "mean" girl mom in her real life, or actually I don't know that I just assume it based on her recent pinterest pins. It actually inspired me to write this post because I want my friend to know she's not alone and that sometimes you think you can fight these people but YOU JUST CAN'T!! Their reality is so skewed that any time you confront them in a mature fashion it looks bad on you because they've already told everyone around you that they are the victim and they tell stories and spin tales so well that people fall for their manipulations. But I am here, I'll listen and I am a great sounding board!! I'll be your supporter if no one else will!! Because no one should have to face a narcissist alone!! Do you know any narcissists?